Holiday parties are a welcome break from the usual flow of life. They bring us together with friends and loved ones and create memories we'll cherish long into the future. Resources for planning holiday celebrations help take the panic out of preparing for these events. Use the fun party ideas listed below at you next holiday party. You'll find ideas for Christmas, Valentine's Day, Easter, Halloween and everything in between. Give them your own special flair and revisit them every time you need to get in touch with a heartwarming memory. Also, check out our Party Calendar for a list of even more holidays and observances to celebrate throughout the year. Are You Ready for Christmas? - An easy Christmas icebreaker based on accumulating points for being the most ready for the holidays. Christmas Carol Game - Guess the names of popular Christmas carols by deciphering their new fun titles. Christmas Chocolates - Easy and delicious recipe for Christmas chocolates. 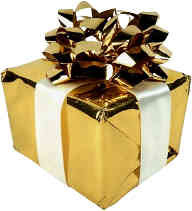 Serve them at your holiday parties or give them as gifts or favors in a beautiful handmade box. Christmas Clay Creations - Use playdough to sculpt clues for popular christmas carols. Christmas Feud - Online survey results to use to host your own Christmas Family Feud party game. Christmas Party Games - Fun party games for Christmas parties. Christmas Party Murder Mystery - Surprise your friends by hosting a one of a kind Christmas party, a murder mystery filled with intrigue and suspense. Christmas Star Puzzle - Assemble this Christmas star puzzle. Christmas Tea Party - The best way to enjoy an afternoon of holiday cheer with friends. Christmas Trivia - The perfect Christmas party icebreaker. A printable version is available upon request. Christmas Video Scavenger Hunt - Capture Christmas related scenarios on video, with the help of strangers. Corporate Christmas Parties - Themes and ideas for hosting office holiday parties. Corporate Christmas Party Ideas - To help get your company Christmas party off to a creative start. Crazy Christmas Scavenger Hunt - Find out-of-place, crazy Christmas items. Name That Carol - Guess the title of well-known Christmas carols. Name That Christmas Movie - Guess the titles of well-known Christmas movies. They're so challenging that we bet you can't. Printable Christmas Games - Professional, affordable, printable Christmas games to purchase for immediate download. Right Left Christmas Game - A fun gift exchange icebreaker based on the nativity story. Ring a Bell Christmas Icebreaker - An easy Christmas party game that everyone can participate in. Ring a Bell and let the fun begin. Easter Scavenger Hunt Ideas - Lead your family to their Easter treats with this fun variety of clues. Easter Party Games - A fun collection of both Bible and bunny Easter party games and activities, including an Easter egg scavenger hunt. Printable Easter party games. Resurrection Eggs Scavenger Hunts - A combination Easter egg hunt and Bible story clue hunt. Easter Bible Verse Scavenger Hunt - Find the puzzle pieces and assemble seven cross puzzles to spell out the seven sayings of the cross. Right Left Easter Game - An Easter party icebreaker or gift exchange game based on the Bible Easter story. Easter Bible Trivia Game - Guess the popular Bible Easter characters from the list of clues provided for each. Adult Halloween Games - Game ideas for adult Halloween parties. Fun Halloween Costume Ideas - Dress up in a diva-worthy ensemble this Halloween. Get inspiration from our list of feminine costume ideas. Ghost Story Mad Lib - Create a humorous ghost story by putting spooky words in unexpected places. Pirate Party - Host a Halloween Pirate Party using our invitations, games and party ideas. Halloween Riddle Hunt - Solve the riddles and find the items with this challenging Halloween scavenger hunt. 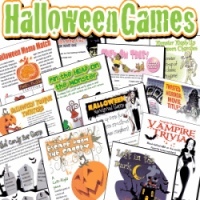 Halloween Internet Scavenger Hunt - Participants completing the Halloween internet scavenger hunt receive a free printable Halloween Pencil Puzzles ebook, including a Halloween trivia, perfect for Halloween parties. July 4th Songs Trivia - A holiday quiz that requires guests to guess the song title from a small portion of the lyrics of an patriotic American song. 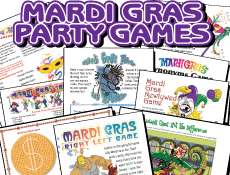 Mardi Gras Party - Fun, colorful Mardi Gras party ideas. New Years Family Feud - Survey questions and answers for playing a holiday version of Family Feud. Stacks - Talk about an icebreaker, this New Years Eve party game will get you up front and personal in short order. Everyone starts in their own seat all alone, but the hilarity begins as you start following the instructions on the cards and stack up on other people's seats as you move left and right. How many people can you carry on your lap anyway? Better do a few leg presses before you head to the party. No doubt about it, you'll have stacks of fun with STACKS! : ) Get ready to take the trip of a lifetime! Oktoberfest Party - Great food, great music, and more fun than a barrel of bratwurst. An old-fashioned German celebration enjoyed all over the world. 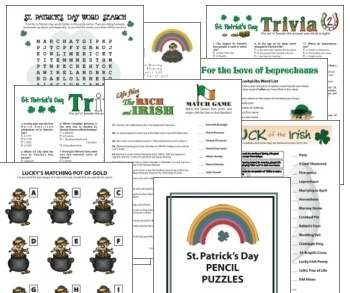 Printable St. Patrick's Day Games - Professional printable St. Patrick's Day games to purchase for immediate download. Green Trivia - Trivia based on all things green. St Patricks Day Party - Cool party games, resources, and activities for a St. Patrick's Day party. Story of St Patrick - A left right game about the life of one of the most famous saints in history. Printable Thanksgiving Games - Games include Turkey Trivia, Family Bingo, Thanksgiving Word Scramble, and Harvest Word Find. Right Left Thanksgiving Game - A unique, one of a kind Thanksgiving story icebreaker game. Thanksgiving Party Games - Game ideas include relays, scavenger hunts, bingo and more. 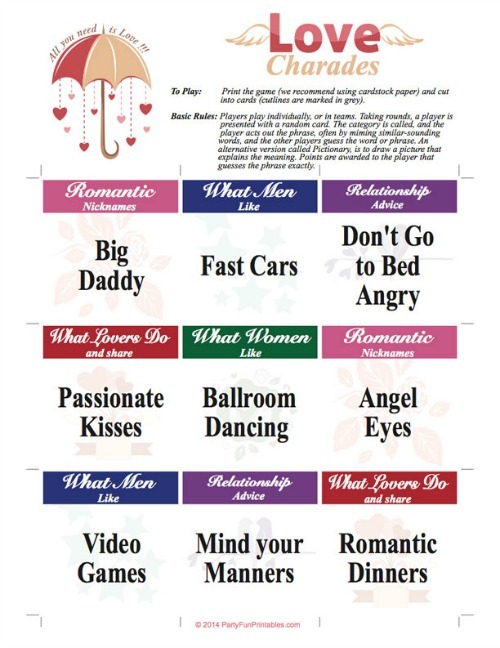 Printable Valentine Games - The right left Valentine game, Valentine Bingo, Valentine trivias and quizzes, Valentine tic tac toe and more are available for immediate download, individually or in a package deal. Red Trivia - A variety of questions based on the color red. Valentine Family Feud - Internet survey results for setting up a game of Valentine Family Feud. Valentine Murder Mystery Party - Host an event to remember. Invite your couple friends to a romantic Valentine murder mystery party. This party kit includes everything from invitations to special award certificates. There is also an alternative for singles or all-girl parties. Valentine Party Games - Valentine party games for couples, friends or mixed groups. Valentines Day Party Themes for friend and couple parties and Valentine Themes for Churches with a selection of complementary game ideas. Valentine Pictionary - Words and titles for a game of valentine pictionary. Valentine Trivia - A multiple choice quiz on the history of Valentine's Day and various other things associated with February 14th.